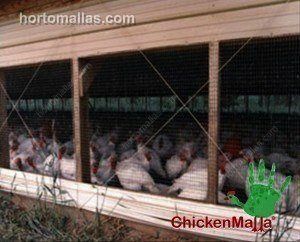 CHICKENMALLA Poultry Netting, the one that does not rust! Poultry netting plastic mesh is the perfect way to enclose big birds in a farm. With a good poultry netting or mesh you avoid the constant problem in chicken farms (also an issue of pig farms) of outside wild birds entering the chicken pens from the open, bringing with them phytosanitary problems, flu, salmonella etc. Besides bringing with them a large number of diseases, birds that enter chicken pens will consume bird feed that is destined to be transformed in pounds of meat for sale, therefore affecting the bird and pig farm´s yield. 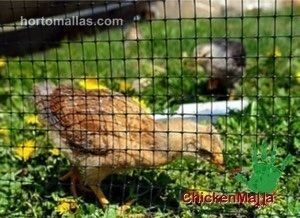 CHICKENMALLA Poultry Netting used in outside grazing and feeding of chicks under organic type of farming. Chicken mesh cannot be just any type of netting, because in between raising cycles the pens need to be disinfected with chemicals and steam, and these actions can compromise traditional hexagonal mesh (hex wire) or poultry mesh. One must also consider that pigs and bird’s feces are highly acid and may corrode metal in just a few months of use, creating the need to replace the netting of the chicken and pig farms every so often as they loose tensile strength or to install a pvc coated hex wire which is very expensive. 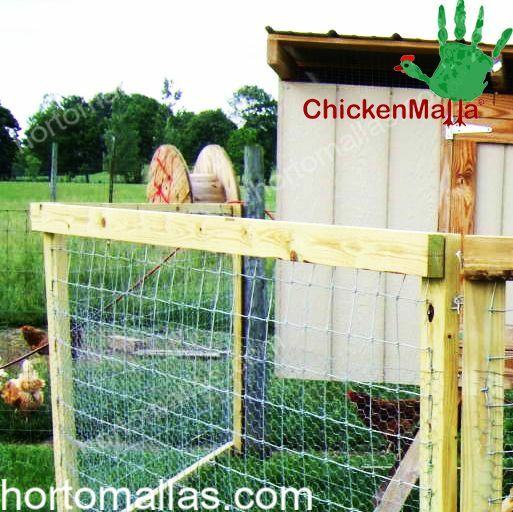 CHICKENMALLA poultry nets are easy to install and do not rust, so they become an irreplaceable tool in poultry farming. 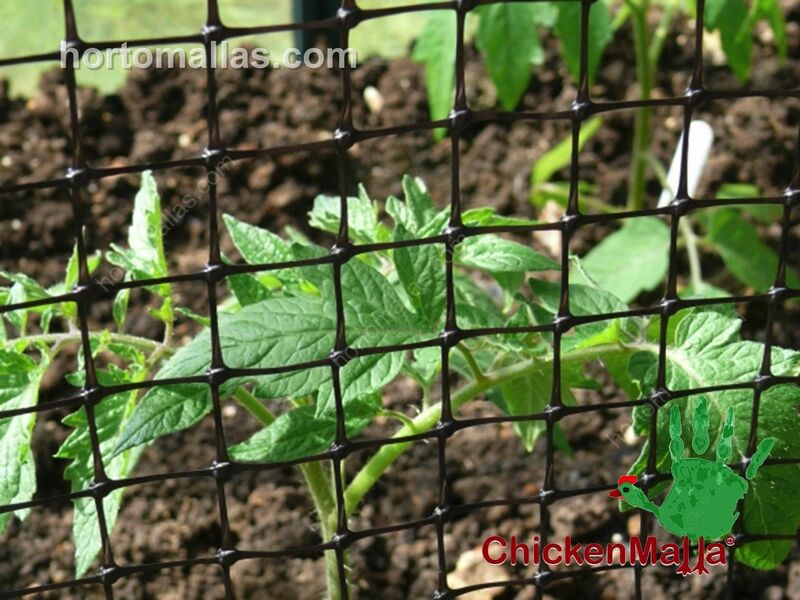 Manufactured from bi-oriented UV stabilized black polypropylene, CHICKENMALLA poultry netting is highly resistant to farm animal waste, so it will last many years under the harshest of conditions. Being made out of plastic it is very easy and fast to install and will not harm the animals nor the workers during its installation and maintenance. 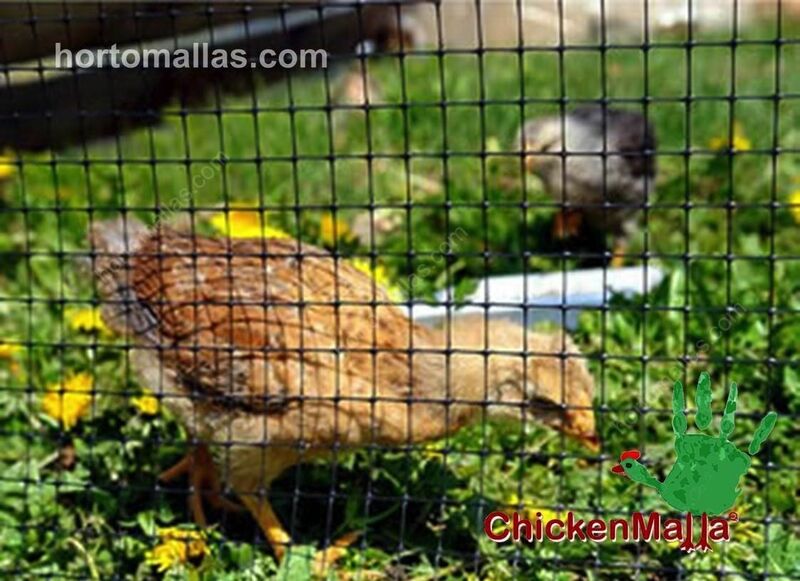 CHICKENMALLA poultry netting can also be used to protect small orchards from birds and other small wild animals. CHICKENMALLA can be used as a mortar or concrete reinforcement in marine areas where sea salt and humidity can be a problem for regular metal concrete mesh. This mesh is also used for erosion control for lawns and steep vegetated hills subject to running water erosion. CHICKENMALLA is also used in aquaculture to prevent cormorants, pelicans or seagulls (among many marauding birds) to enter fish and shrimp farming tanks and feed on your stocks. The other common use of CHICKENMALLA is to prevent migrating birds from entering cyanide tanks in mining applications or or leachate evaporation ponds in landfills. If you require a lighter weight net you may ask for Guacamallas anti bird netting. Plastic poultry mesh can be used as a temporary and movable pen to keep young chicks in a garden without them roaming around and keeping their predators ar bay. CHICKENMALLA is also used in tropical marine areas to build cages for exotic animals. Plastic poultry netting is easily installed on entry points of warehouses or food packing plants, poultry pens, chicken tractors, chicken coops, it can also be used to protect gardens and orchards against deer or as a dog kennel. Plastic poultry mesh is fastened on gates and balconies to prevent toys or pets to go through the bars. 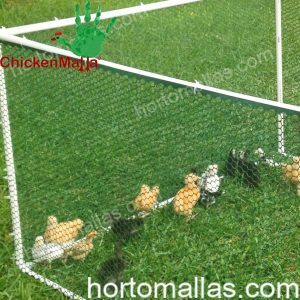 In organic farming, CHICKENMALLA poultry nets are used to create provisory pens in rotational grazing in grass feeding operations, especially for larger birds like ducks, geese or turkeys. Joel Salatin´s example of good farmland management using Voisin´s method which replicates what happens in nature where large herds go through plots as a highly populated group of animals devouring what they can as fast as they can (creating sort of a food competition that will not discriminate between weeds and more desirable varieties of grasses). Applying nature´s way of mowing grasses (and exposing insects that birds can then get to) is the way to keep a balance between species and a soil rich in nutrients (as compared to extensive methods of livestock management which tend in time to desertify large areas of what used to be good farmland. Chicken coops can be built with simple wire mesh or poultry mesh netting. You are most welcome to ask our biologist and agronomists any suggestions on how to use poultry netting in your particular situation. We have extensive experience in farm life and will be glad to provide you with any information available to us. CHICKENMALLA is available in black as it is the longest lasting UV treatment available on plastic chicken nets.